"Tracing Masonry In Arizona Back to the Old West"
In the latter half of the nineteenth century the American frontier was comprised of the western territories from Oklahoma to the Pacific Northwest. The news media of the time focused attention on the western territories and undoubtedly played a significant role in the inexorable wave of intrepid pioneers, settlers, opportunists and prospectors that flooded into the territories. That period of time is often referred to as 'The Old West' or 'The Wild West'. Arizona is the backdrop of many movies and novels about the Old West. Western novelist Zane Grey regularly spent time on the Mogollon Rim near Payson, Arizona. Early motion pictures depict Arizona cowboys and lawmen portrayed by actors such as Tom Mix and John Wayne. In those movies the heroes and villains were sharply defined and a clean-cut cowboy always, "saved the day." However, novels and movies seldom depict an even greater legacy that a few pioneers and settlers brought with them as they populated the territories. They brought morals, values and a strong sense of brotherly love, relief and truth with them. They brought Freemasonry to the territories. In 1863 political concerns and the pressures of the Civil War were largely responsible for the separation of the Arizona territory from the New Mexico Territory. That year President Abraham Lincoln appointed John A. Gurley as Governor of the newly created Arizona Territory. He was to establish a government thus ensuring that Arizona Territory and its resources would be and remain under Union control. Governor Gurley died before he could arrive in the territory. John Noble Goodwin was appointed by President Lincoln in his place. John Goodwin, a Freemason, and his party arrived in the Arizona territory in December 1863. He established the territorial capital of Prescott, approximately twenty miles from Fort Whipple. In 1864 nine Master Masons held a meeting in Prescott at John N. Goodwin's house. Brother Goodwin presided at the meeting. After satisfying themselves that all present were Master Masons, those nine Masons decided to apply to the Grand Lodge of California for a dispensation to open a Lodge at Prescott. The name selected for the new lodge was Aztlan. Brother John T. Alsap, who later became the first mayor of Phoenix, was chosen as its first Master. Brother Goodwin was chosen to present the petition to the Grand Master of California. Brother Goodwin presented the petition on April 23rd, 1865, and the dispensation it requested was granted. In January 1867, after the California charter had been granted, Aztlan Lodge No. 177 was duly constituted and the officers installed by Past Master John Martin. Freemasonry had officially arrived in Arizona. Thereafter, four more lodges were formed in succession. These four are Arizona Lodge in Phoenix (1879), Tucson Lodge in Tucson (1881), Solomon Lodge in Tombstone (1881), and White Mountain Lodge in Globe. All but White Mountain Lodge were chartered by the Grand Lodge of California. White Mountain Lodge was chartered by the Grand Lodge of New Mexico in 1881. On the 23rd day of March, 1882, representatives from these four lodges convened in Tucson for the purpose of considering the propriety of establishing a Grand Lodge of Free and Accepted Masons for the Territory of Arizona. A committee was formed to examine the credentials of the attending delegates, and after its satisfactory report, it was resolved that by virtue of the powers vested in the members assembled it was right and proper that a Grand Lodge for the territory should be formed. 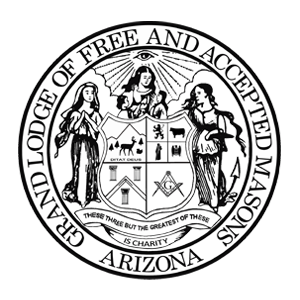 A constitution was adopted and it was formally resolved, "That a lodge of Master Masons be opened for the purpose of organizing and opening, in Masonic form, the Grand Lodge of Free and Accepted Masons for the Territory of Arizona." Officers were appointed to fill the stations and places and a Lodge of Master Masons was opened in ancient Masonic form. The various officers were elected as follows: Ansel Mellen Bragg, Grand Master; John Tabor Alsap, Deputy Grand Master; Alonzo Bailey, Senior Grand Warden; William Arthur Harwood, Junior Grand Warden; Abraham Marx, Grand Treasurer; and George James Roskruge, Grand Secretary. On the 25th day of March, 1882, the grand officers were installed and the Master Masons Lodge was closed in the ancient Masonic form, the convention having accomplished the business for which it was called, adjourned sine die. The Grand Lodge was then opened in proper form, with music by a choir and prayer by the Grand Chaplain, after which it examined and endorsed the charters held by the various lodges represented. Then it was decided that, "The Grand Lodge claimed as the boundaries of its jurisdiction the whole of the Territory of Arizona," and further, that the Grand Master be authorized to endorse the charter of Aztlan Lodge when called upon to do so. On March 25th, 1882, after installing the grand officers and accomplishing the business for which it was called, the Master Masons Lodge was closed in ancient Masonic form, sine die. Aztlan lodge later became a chartered member, and together the five lodges forming the Grand Lodge had a total membership of 274 Masons. Those five original lodges are still in existence today and are designated 'Territorial Lodges'. WHERE DID MODERN FREEMASONRY COME FROM? In 1717 four Lodges in London met together and decided to form a Grand Lodge, possibly for no other reason than to strengthen and preserve themselves. In 1723 they adopted a Constitution. Their success led to the establishment of still other Grand Lodges. In 1725 some of the Lodges in Ireland formed a Grand Lodge and a similar body was instituted in Scotland in 1736. Moreover the original Grand Lodge in England did not remain without rivals, and at one time in the eighteenth century three Grand Lodges existed in England in addition to the one organized in 1717. Two of these died out without influencing the history of Masonry in general, but the third had a great part in the spread and popularizing of Masonry throughout the world. It called itself the Ancient Grand Lodge. The two surviving Grand Lodges were long and vigorous rivals, but they finally united in 1813 into the present United Grand Lodge of England. Thus, from one of these two Grand Bodies in England, or from those of Ireland or Scotland, all other Grand Lodges in the world today are decended. Titles of Grand Lodges in the United States also vary. Some Grand Lodges are called A. F. & A. M. which means Ancient Free and Accepted Masons. The most commonly used title, like that used in Arizona, is F. & A. M., or Free and Accepted Masons. Masonry was established in France sometime between 1718 and 1725. The first lodge in Spain was established in 1728. A lodge was established in Prague in 1729, in Calcutta in 1728 and in Naples in 1731. Masonry came to Poland in 1734 and Sweden in 1735. The growth of Freemasonry and its ideals and beliefs came not without opposition. Masons are taught that all men are equal - We meet upon the level. Individual freedom of thought and action, as well as morality and ethics, are the concepts and ideals upon which our order is founded. The teachings are a condemnation of autocratic government, who in turn condemn Freemasonry.